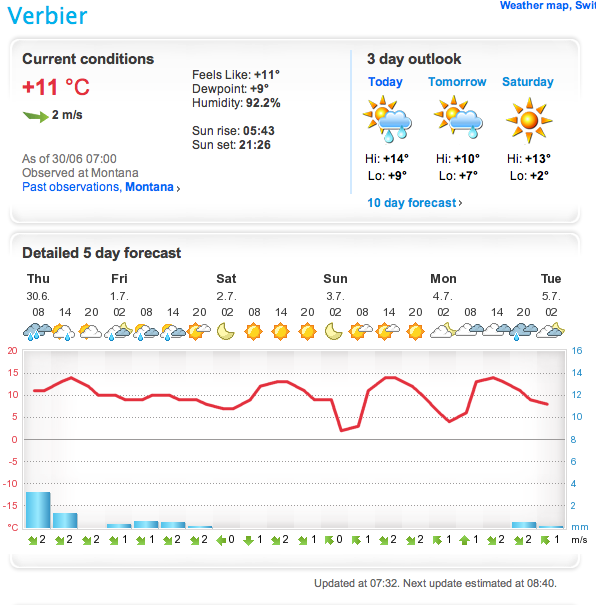 After last years DNF at 76 km, I was determined to finish Trail Verbier St-Bernard 2011. The first two editions of the race had been rainy. This time excellent weather was forecast for both Saturday and Sunday. No rain, no storms. Everything looked fine. 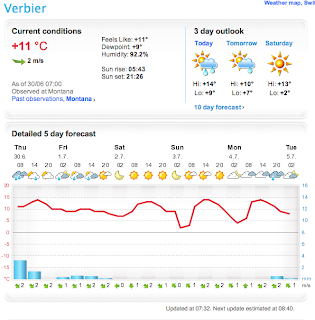 When I arrived in Verbier on Friday, I got a headache and felt quite nauseous. I have no idea what caused it. Possibly simply the altitude of 1500 meters. I just ate a few bananas, drank mineral water, took a magnesium supplement, sprayed my legs with Magnesium Oil (liquid magnesium that absorbs through your skin), and went to sleep around midnight. When I woke up a couple of hours later, I felt pretty good. After a couple of ice coffees I was ready for 110.5 km La Boucle (The Loop with 7014 meters of cumulative ascent and descent). Except that due to some minor nagging injuries I haven't been able to do any substantial hill training at all during the past year. So actually I was in a poorer condition than last year. That made me nervous, but I decided not to worry and give this my best shot anyway. I was going to use Mountain King Trail Blaze poles the whole way to delay the inevitable leg muscle soreness. The race started at 5AM, and I stayed at the back, resisting the urge to go out fast. Not that I have could have sprinted anyway for too long, as the 950-meter climb up to Pierre Avoi started right away. This is a tough course. 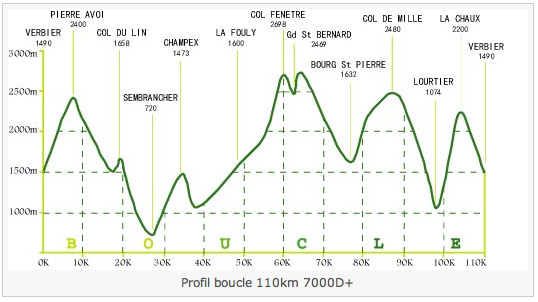 That's why finishers of La Boucle are awarded with maximum UTMB points (4). Everything went very well until the poles almost ended my race in the first downhill. After 1h50min I was descending towards the first aid station at Croix de Coeur. When I reached for another gel from my pocket, my leg caught one of my poles and I fell forward. Luckily I had just read 'Relentless Forward Progress' by Bryon Powell. There was a special section on how to fall (p. 113) stating "...it's only a matter of time before you fall". The first of the five tips listed there was "Speed up". I thought that "...accelerating your foot turnover to run your way out of falling" seemed like a good idea. Somehow that piece of advice suddenly flashed through my mind, and instead of trying to break into a face-plant (been there, done that), I immediately dropped my poles and the gel on the ground and accelerated downhill like Usain Bolt. To my ashtonishment it worked! About 30 meters later I gained control and was able to stop gradually and gracefully. Only my shoes hit the ground, which I found amazing. When I walked back to retrieve my stuff other runners coming down after me were smiling or rolling their eyes. I was actually able to enjoy a pretty good laugh with them afterwards. Thanks Bryon, your book saved me! I didn't take any unnecessary chances after an adrenaline shot like that. I reset my priorities for the race as follows: 1. Stay safe and avoid accidents; 2. Eat, drink and have fun with all the friendly people; 3. Finish the race. My nutrition strategy was based on mainly on cola drinks and SiS Go gels. I carried two plastic water bottles in front of my 5-liter backpack designed by legendary UTMB-winner Marco Olmo. I carried Nuun Kona Cola electrolyte tablets with caffeine, which were convenient to throw in when refilling my bottles with mineral water at aid stations. Real Coke was also available at all aid stations, but since it was too fizzy to be taken away for the run (Kona Kola didn't cause the cap of the bottle to blow up, like Coca Cola does), I simply stopped to gulp it at every aid station. I also took whatever food they had, like fruits, soups and pies. It got pretty warm during the day, and I took a few SaltStick caps as well. I reached the village of Le Levron at 8:37 AM. I was 214th out of 270. That's 3h37 min for a half-marathon. I felt the familiar plantar fasciitis pain creeping into my right foot, but I ignored it. Something more important had caught my attention: a wide range of home-baked pies and cakes, served with coffee. That was time well spent. Au revoir & Merci beaucoup! The next big climb to Champex (34 km, 6h02min) went smoothly. 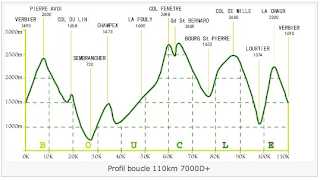 From there we followed the UTMB trail to La Fouly, going down and up again. I can't quite put my finger on it, but somehow this trail feels so much longer than the officially measured distance of 14.4 km. Maybe it has something to do with the fact that the temps tends to rise that time of day. There's nothing you can do about it, so I just kept drinking and eating gels, saying bonjour to every hiker that I met (there are lots of hikers on UTMB trail in July), chatted with a few fellow competitors, and generally felt much stronger than last year. At La Fouly (48 km, 8h36min, 189th place) we got our only access to our drop bags. I grabbed a Red Bull and some chocolates. I left most of my extra warm clothes in the drop bag, because the weather seemed so warm, and I didn't think I'd need that much. I'd regret that decision at night. What beats me is why the organisers don't provide another access (or another drop bag) later on, ideally in Bourg St. Pierre (76 km). Being a skinny (and possibly lazy) dude, I hate dragging a heavy backpack all day long. Soon after I started my climb towards the second highest point of the course, Col de Fenetre (2698 m), I met Janne, an experienced Finnish ultra trail runner, who was training there with a friend. He told me the weather was currently looking good up to 3000 meters with possibly some clouds up there, although he wasn't sure how it would develop at night. Mountain weather can change in a heartbeat and is difficult to forecast. I reached the top of Fenetre (59 km, 12h04min, 175th place) without any issues. It was windy up there, so I just grabbed half a bottle of coke before continuing down to Grand Col St. Bernard, the home of those big friendly rescue dogs. I knew our course briefly visited Italy, but I didn't notice anything special, except the main road we had to cross a couple of times. Suddenly I heard some extremely loud screamy whistles coming from somewhere near me. I assumed it had to be an official who wanted to see my passport, but I couldn't see anyone. Then I noticed that a large brownish bird of prey had been watching me on a boulder right beside me. It's piercing scream sure scared the living daylights out of me. Soon I was at the St. Bernard aid station, gulping hot noodle soup. I talked with Matti the Finnish guy, who was working there as a volunteer the last time as well. It was 6 PM already and the Northern wind was getting stronger and it was a bit cold out there. I put on my jacket, beanie and gloves. I climbed Col Des Chevaux (2714 m), the highest peak of the day, as quickly as possible to reach Bourg St. Pierre (76 km) before sunset. I made it, but only barely. I was there 9:24 PM, two minutes before the sunset. There is a whole building reserved for the competitors. After eating a simple spaghetti dinner I took a little rest in the first aid/massage room, where I quit last year due to hypothermia. I wanted to put on more clothes at this point, but there was nothing I could do about it as I didn't have anything left in my backpack, we didn't get access to our drop bags anymore, and I failed to recruit any crew to assist me. I left an hour later in full darkness. There was a long stream of headlights going up the mountain towards Cabane du Col de Mille, a famous local alpine cabin 12 km away. The mostly uphill journey there wasn't easy and it was estimated to take three hours or more. The temperature had suddenly dropped close to zero Celsius, the freezing point. The North wind was getting a bit stronger and colder. Many runners experienced various issues, like headlight batteries not lasting as long as expected, clothing not feeling as warm as expected, and semi-frozen gels and drink bottles. After a couple of hours I saw the dim lights of a house, that must have been the Mille cabin as there were no other lights anywhere. The problem was that it seemed to be still so far away that I wasn't sure if I could make it. There was a Swiss runner who seemed to know what he was doing and was moving fast. I decided to follow on his heels to get to the warmth of the cabin asap. Then we spotted a rescue helicopter with bright beam of light about half-way between us and the hut. Somebody had obviously called for emergency help! We were now running the roller coaster trail almost kamikaze style. Maybe we could get there in time to help someone who was in trouble. However after about quarter of an hour the chopper stopped whatever it was doing. It briefly flew beside us, checking us up with the bright beam of light, then pointing the light towards the cabin, and then disappeared. After what seemed like a long time we finally arrived at the cabin. It was 1:40 AM, early Sunday morning. The race had started 20 hours and 40 minutes ago. My legs had gone 88 km with 5710 meters of cumulative ascent and 4720 meters of cumulative descent, and they were done. The pain didn't bother me. The problem was that there was nothing much left to play with. The wheels had come off, and they weren't coming back any time soon. For the past hour or two I had been moving forward more by pushing with my poles than with my legs. Still, I was planning to continue after a little rest. According to the rules, the competitors must leave the cabin by 4 AM, or DNF. I had plenty of time to think about it. The cabin kitchen was well stocked. They had everything frozen runners wanted: hot bouillon, coffee and tea. The cabin had a wood-burning stove, and it was really warm and nice inside. In front of the stove there was lying a man without any noticeable signs of life. That must have been the runner the chopper rescued. They said he would be ok in the morning. They said there was a nice warm bed with my name on it, if I decided to stay the night there. I sure felt tempted to quit, but there were a couple of guys who said they planned to go for it, and asked if I would like to join them. I estimated that if we left 2:30 AM, it would take about four hours in our present condition to reach the next stop, which was Lourtier, a town down in the valley. Then it would take us another three ours to reach the top of the last mountain, La Chaux. There would be sunlight by then, but several people had warned me that the hill is very steep. From there down to Verbier it would take only about two hours. So 9 hours from now meant we could finish by 11:30 AM, before the final cutoff. I told them yes, count me in. This was my last chance. Before leaving I went to the toilet, which was located outside about 50 meters away. When I got back a couple of minutes later, I was already shivering uncontrollably. Not a good sign. The weather seemed even colder than before. Although there was no rain, it was a bit foggy. Difficult to see clearly. Some sections of an alpine trail were always going to be wet, which meant they could be a little bit icy by now. Ice is difficult to see with a headlight, especially when you are going downhill. I might fall and get seriously injured. I didn't want to take a risk like that. So when I stepped back inside, I announced that I'd just changed my mind. A brief visit outside had cleared my mind and helped me see what's realistic. I gave my timing chip away and went to sleep in my bed. After dawn we were served coffee. There were about a dozen of us who had quit there. Someone pointed at a very narrow dirt road down in the valley. They would kindly get us a free taxi there. We started moving down slowly and obviously painfully. It took us some time to get to the road, but it also took a some time for the taxis to get there. The humble mountain path was not wide enough for them to make the turns without reversing. It was around 11 AM on Sunday as we walked across the finish line. We made it there well before the cutoff, just like it had been dreamed by all of us. There were people welcoming us and asking us to pose for finisher photos. It was a bit embarrassing to explain we were just drop-outs. We only went there to fetch our bags and stuff, but they seemed to get it instantly: "Oh, so now you'll have to come back next year?" 161 out of 270 competitors were able to finish TVSB La Boucle 2011 within the cutoff-times. That's 60%. Congratulations! Good effort Paleo-runner. It was a very tough course. I dropped with an Achilles injury at Grand St Bernard, but wow, the Lac de Fenetre are simply stunning! Thanks Craig. This race is surely the most grueling thing I've never done! Fenetre is my favorite part of the course too, it's like a world of its own. Hope your injury gets better soon, you have quite a race schedule planned for this season! Good luck for UTMB. good effort. sometimes you have to be realistic and not masochistic. What do you need to do in training to make sure you can finish it next year? 1. Go up and down steep technical mountain trails at high altitude. make sure the terrain includes some snow, water, rocks, mud etc. 2. Do the same as above, but at night, when the only light source is your headlamp - and make sure it's cold and or otherwise challenging weather when you do it. Running at night in this year's race was very exciting and fun, but also very challenging and dangerous. 3. There's really no need to run very fast at all, like Geoff Roes testifies in Relentless Forward Progress. I did everything wrong this year, and I was aware of that all along. I trained on fast easy roads or trails at sea level. I got myself injured several times over. Obviously I live in the wrong place, as there are no mountains around here. Summer nights in Scandinavia can be sunny, so we usually train without lights. In winter it's dark, but usually there will be snow, which makes it easier to see around. By the way Craig (who posted a comment above) lives currently in Switzerland, and even he complains that the terrain is not difficult enough in the area he lives in! He had to travel hours by train to train for this race! Ideally one should live in the Alps the whole summer. I'm still thinking if I should try again. After the race Sebastien, the owner of Hotel Phenix in Verbier, joked if he should already make reservations for my comeback in July 2012. I told him I'm not planning to come back there for the third time, but then I added that that's what we runners always say after a hard event. Zentri swims across Lake Tahoe - cool!